Goodbye ACQ (ACQuiring Knowledge in Speech, Language and Hearing) with the quirky title and hello to the sensibly named Journal of Clinical Practice in Speech-Language Pathology. Like its predecessors, Speech Pathology Australia's rebadged clinical and professional journal, JCPSLP, provides a forum for the 4,750 or so members of the association, and is published three times a year in March, July and November. Webwords lives on it its new setting in print, and indeed in a new setting on the web at www.speech-language-therapy.com; more of that shortly. The first three Webwords columns appeared in ACQ in 1999, the International Year of the Older Person and the year that Speech Pathology Australia celebrated its 50th birthday. It continued to thrive when the association turned sixty in 2009, but we will need to think about a succession plan (or a wake) for the ageing Webwords some time between now and the association's 70th and the author's 75th in 2019. Pam Snow was editor when I took bumbling first-steps into Internet column writing while becoming accustomed to being called 'Australia's Judy Kuster' at regular intervals. Inveterate web weaver Emeritus Professor Judith Maginnis Kuster is famous in SLP circles for her Net Connections, Stuttering Home Page, and Internet columns in the ASHA Leader. Dr Snow, who introduced the 'new look' and newly renamed ACQ in her February 1999 editorial, had taken over from Lynette Hodgson who had been editor of The Australian Communication Quarterly, which actually was issued quarterly. The ACQ editors who followed were Sharynne McLeod (editor of our International Journal of Speech-Language Pathology), Liz Spencer, Cori Williams and Suze Leitão, Chyrisse Heine and Louise Brown, Marleen Westerveld and Nicole Watts Pappas, and currently Marleen Westerveld and Kyriaki Ttofari Eecen. Each editor or editorial double-act has had a characteristic in common - dedication to producing the best possible edition of the journal on each and every occasion, on time, on topic and in touch with current issues. All facilitated by one, a mysterious presence called 'pubs' at, or rather '@' National Office; two, author and long-serving copy editor extraordinaire, Carla Taines; and three, designer and stalwart typesetter Bruce Godden of Wildfire Graphics. Members who read credits pages know Carla and Bruce have seen to it that the journal reads well and looks good since 1999. Take a bow! 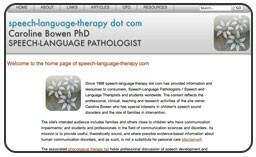 Meanwhile, speech-language-therapy.com pursued its mission of providing useful resources and trustworthy information about human communication disorders and was accessed by increasing numbers of people. Just one resource page could be expected to be visited by 30,000 visitors a month, and this translated into around 120,000 downloads of intervention materials in a month for that one page. Feedback from colleagues everywhere indicated that the site's content was appreciated and well-used, especially by clinicians and clinical educators. In August 2011, just as speech-language-therapy.com received its 20 millionth hit and was experiencing record numbers of visitors per day, something unexpected happened. The American company that hosted it withdrew support for the server extensions that had been in place since 1998. This meant the site was doomed to stay in a frozen form, uneditable, for as long as the company received its monthly hosting fee, or until I took it down. This was a signal to abandon it and start again. Walking away from it was not an option given the way it appeared to be valued and utilised by the profession. After intense work the site moved to a new host, iVent, a short distance from home in Australia. The talented team at iVent, designed the new site and did the CMS build but it was my job to populate it. 'Populating it' has meant having to variously remove, re-write, re-code, replace and relocate all the content from the old site to the new one. The first stage took three months, and the work is ongoing. The home page addr ess remains the same but all the other URLs are different. Outdated and infrequently accessed content has been removed, a powerful search tool augments the site map, new and revised articles and resources have been added, there is a comprehensive glossary, the links have been reorganised, and it all has a new look. In populating the site, picking over every inch of the huge old site was an unwelcome task. It provided, however, an opportunity to review all the external links, including 160 of Speechwoman's sites of the month and the site's main links page, and note changes that have taken place since 1998 in the way we use the Net for professional purposes. Nowhere are these changes more apparent than in the sites mounted by the Mutual Recognition of Association Credentials Agreement (MRA) signatories: ASHA (USA), IASLT (Ireland), NZSTA (New Zealand), RCSLT (UK), SAC (Canada) and SPA (Australia). The mission of any SLP/SLT professional association is reflected in the pages of its web site, and is to represent the interests of its members, and in so doing, their clients. Members benefit through access to members' only areas and the sites vary in term of what they offer to non-members in search of resources. The American Speech-Language-Hearing Association (ASHA) is the professional, scientific, and credentialing association for 145,000 members and affiliates who are audiologists, speech-language pathologists and speech, language, and hearing scientists. Non-members have access to copious information and The ASHA Leader Online. The Irish Association of Speech and Language Therapists (IASLT) is the recognised professional association of SLTs in Ireland. It has an interesting News Archive and a free Update magazine. The New Zealand Speech-Language Therapists' Association (NZSTA) is the professional association and regulatory body for speech-language therapists in New Zealand. Its New Zealand Journal of Speech-Language Therapy (2003-2007) and Communication Matters magazine are free for anyone to download. The Royal College of Speech and Language Therapists (RCSLT) is the professional body for speech and language therapy in the UK, representing speech and language therapists, support workers and students. The RCSLT works with members to represent the profession at the highest levels. It consults with governments, other professional bodies, unions, universities, charity partners and commissioning authorities on behalf of its 14,000 members. The RCSLT Bulletin is available at Issuu. With more than 5,400 members, Speech-Language Pathology & Audiology Canada (SAC) is the only national body that supports and represents the professional needs of speech-language pathologists, audiologists and supportive personnel inclusively within one organization. Through this support, SAC champions the needs of people with communications disorders. SAC's Canadian Journal of Speech-Language Pathology and Audiology is freely available. Speech Pathology Australia (SPA) is the national peak body for the speech pathology profession in Australia, striving for excellence and recognition for the profession and representing the interests of 5,000 members and their clients with communication and swallowing difficulties. As well as having a web site that presents an attractive, corporate image, Speech Pathology Australia has an entry in Wikipedia, a Facebook presence, it tweets (but not very often) and has desultory conversations on its message boards. It reserves access to its publications to members only, and they can enter the secure area to reach Speak Out, the ACQ Archive, IJSLP, and now, JCPSLP!